Fatman reveals a brace of new iPod docks for Christmas | What Hi-Fi? The ValveDock MkII builds on its predecessor with more power, up to 2x25W, and the addition of a USB input. The two-piece design combines a separate amplifier with a trio of valves and matching iPod dock with remote control. The Carbon Trinity is the third-generation machine in the Fatman 'all-in-one' line. 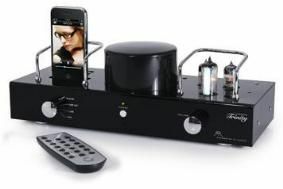 This hybrid vacuum tube amplifer (2x25W) features an on-board iPhone/iPod dock, USB socket, and a subwoofer output if you want to add more bass. Both are available in the UK now at the prices stated.